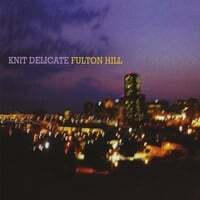 Knit Delicate-Fulton Hill. As anyone who's read this blog for more than a little while knows, I'm a sucker for bands that can mix power pop and alt-country. And this band from Wisconsin sure knows how to weave a pop tune with a slight twang, as they follow up Pressed, their debut and one of 2007's more overlooked gems. Sounding like the Gary Louris-led version of The Jayhawks mixed in with a little Rich McCulley, they even mix in a little Big Star on the opener "Really Shouldn't Say Those Things" and the brilliant "When I See You". Other standouts include "Love is Not Democracy" and the pop sheen of "Had a Chance", in which they channel America. And they love punny references as much as I do, otherwise they wouldn't have a track called "Spin Cycle" on the disc.